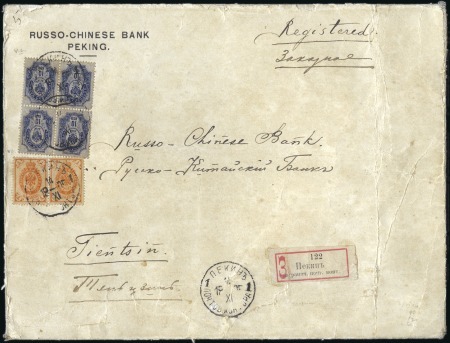 PEKING: 1905 Large linen envelope from the Russo-Chinese Bank registered to their office in Tientsin, with ordinary Russian 1k pair and 10k block of four tied by Peking 14.11.05 cds (T&S type 6), reg’d label in Cyrillic adjacent, Tientsin arrival, a scarce usage between Russian P.O. in China. Note: Ordinary Russian stamps were not sold in the Russian P.O.s in Peking but were accepted if supplied by the customer.